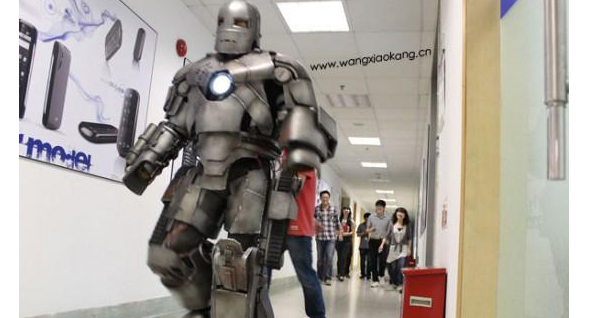 On June 3 2011, Wang Kang (a 25-year-old office worker in Shanghai, China) walked into his office building wearing a homemade Iron Man suit. Designed after the original Iron Man suit that Tony Stark built in the desert in the original movie, it's made of foam, wires, tubes, and an arc reactor made of glass. After three months of work and 3,000 yuan (about $460), Kang surprised his co-workers and the streets of Shanghai with it. Check it out. What do you think of the suit? Like Iron Man meets Robo Cop. Not bad for the cost. Some people spend thousands and it doesn't look half that good. And I think we should let Jeremy be Iron Man for a day!